I'll never forget my first surround sound system. It was a silver JVC 5.1 HITB cheapo system that I bought on a clearance table from a local home furnishing store. I didn't care that it was bottom of the barrel offering as I was bumping the intro of Pearl Harbor for my family coupled with my brand new 57" Sony Rear Projection 1080i HDTV! I also remember playing games for the first time with a REAL surround sound system instead of those tinny TV speakers I was so used to. It was a game changing moment in my adult, geeky life. It's amazing that almost 20 years ago I was geeking out to Dolby Digital and DTS 5.1 for the first time. Oh how times have changed. By the way, my current studio system is nearly double the size in both speakers and sub, which quite honestly, I thought those were compact for the quality sound I was obtaining from them. In an age where some home spaces are getting tighter and tighter, compact size with and appealing aesthetics (wife factor) are both extremely important. In that department, this system scores perfect marks, especially the Piano Gloss Black finish we tested. Compact yet elegant. Regardless of a solid reputation that SVS carries, my skepticism continued even into the beginning moments of testing out the Spectre Blu-ray I'd been anxiously waiting to try out. When the opening moments of the Dia de los Muertos parade came crashing onto the screen and the incredible sound design filled my ears, I quickly realized, this system is truly a revelation. The pounding bass that filled the room through crashing buildings and explosions, the loud yet sharp dialogue that emanated from the small center channel, the whipping of whirling helicopter blades in the rear surrounds; all came together to create of symphony of beautiful sounding chaos. I almost couldn't believe what I was hearing as the system that looked so puny and honestly, underwhelming, now sounded cleaner, sharper, and absolutely room-filling compared to my precious $3000+ system lying in heaps to the side of my sectional sofa. I stared at the Prime system and back at my other speakers and sub several times in utter disbelief. Not satisfied enough with the stunning performance of movies I system, I had to jump into the next stage of testing: pure, unadulterated gaming. Ahhhhh yeah! Let's see what these babies can really do. For a fantastic mix of sonic testing, I first chose the zombie mode in Call of Duty: Black Ops III. I like playing that as a test because there is plenty of strong dialogue, jazzy little rifts, and most importantly, sharp and cracking gun fire to really crank and tick off parents/neighbors/police. After cranking my Pioneer 1222K D3 Amp enabled Elite system to almost record highs, I suddenly realized I was grinning madly from ear to ear. I'm running out of descriptions to use for the sound this system produces but let's just say that I ducked and winced literally when zombies moaned through the rear speakers, I smiled in delight and the absolute BOOM I heard from some of the rifles yet even the most nuanced details of the jazzy tunes were enjoyed. Gamers, if you want to truly experience your gaming titles, this is thee system to do it on. I was truly amazed after every game I tested due to the lush details and powerful moments perfectly rendered on this compact but absolutely gigantic sounding system. The world of home theatre and audio can be quite the dangerous area to start diving into money wise. Why? Because you can literally start with a $200 speaker system and then find yourself debating whether to upgrade to a $20,000 system in no time at all. I don't live in a $20,00 system world and I'm guessing that most of our readers don't either. 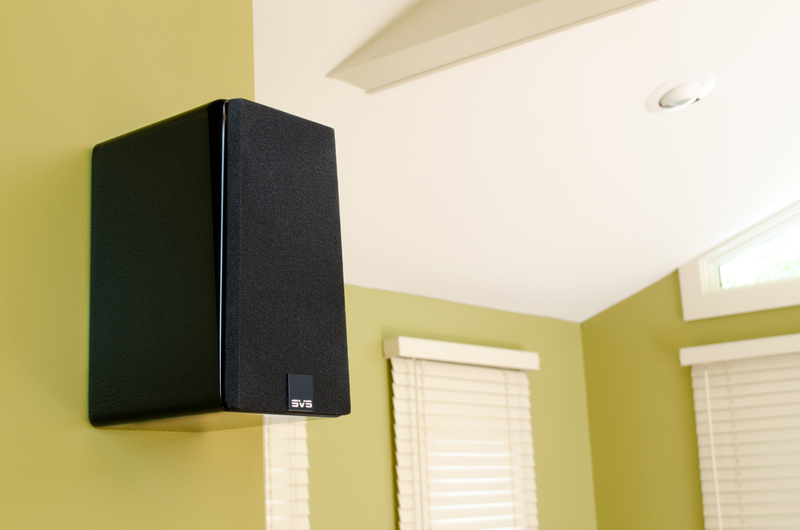 The SVS Prime Satellite 5.1 Speaker System is supreme home theatre sound for the rest of us. Starting at just $999, you have an investment for life, not only for movies and music but more importantly, for all your gaming experiences. SVS makes the deal even sweeter with a huge array of extras to sweeten the pot and solidify your buying experience. Hey, $999 is still an investment and you want to make sure your choice is the right one. SVS features an unmatched Bill of Rights for us, the consumer. How about free shipping? Done. 45 Day no questions asked In-Home Audition? No problem. 5-Year unconditional guarantee? Included. The customer service and warm fuzzy feeling is quite frankly, unbeatable. I am absolutely floored by what I've tested here and every time I tried to exploit a possible weakness in the system, I came up surprised and delighted. My first hesitation was such a small speaker for my center channel that is so important in any game or flick. The next was the compact sub (only 13.5" (H) 13" (W) 14" (D)) in a large room but behold, it thumped, pounded, and beat its way into my nerdy heart. Fear not skeptics, because no matter what I threw at this system, it handled the loads not only with ease but true finesse. Therefore, I am pleased to give these bad boys our rare but well deserved perfect score. If you want to truly experience what sound and game designers intended, this system deserves a spot in your living room/den/man cave, now. Today. This instant. Check 'em out with all the detailed specs on SVS' main product page. GRAND THEFT AUTO And POKEMON Combine For An Amazing Fan Video!